The National Democratic Front-North Central Mindanao Region (NDF-NCMR) expresses its gratitude to the Local Third Party Facilitators in the region composed of Christian religious leaders as well as the Local Crisis Committee (LCC) of Misamis Oriental for their assistance to the family of Prisoner of War (POW) Pfc. Adonis Jess Lupiba. He still is under custody of a New People’s Army unit since July 11, 2015. We are hopeful their efforts would succeed in securing the necessary conditions to effect the safe and orderly release of the POW. At present, the ensuing “rescue operations” of the 58th Infantry Battalion and Special Forces Company of their captured trooper further delays his early release. Up to nine rounds of harassment operations were launched by adjoining Sub-regional Commands of the NPA—the Eastern Misamis Oriental-Northeastern Bukidnon (EMONEB) and South-Central Bukidnon (SCB) Sub-Regional Command, against troops of the 403rd Brigade since July 19. Twelve of the latter e killed and scores were wounded as a result. Last August 12, another seven trooper of the 58th IB were killed and a number suffered wounds in this latest clash between a unit of NPA-EMONEB ug the reactionary soldiers in San Roque, Aposkahoy, Claveria, Misamis Oriental. A Red fighter heroically succumbed to death in here. Despite the “rescue” operations of the Armed Forces of the Philippines, the concerned custodial unit of the NPA observes the proper rules in combat and the international humanitarian laws regarding the handling og POWs. Once again, we maintain our openness in negotiating with the Local Crisis Committee which represents the Government of the Philippines in the local level regarding the date and place of the release of Pfc. Lupiba through the Local Third Party Facilitators. The POW’s family can be assured of his early and safe return through the said negotiation between the NDF of the region and the LCC of Misamis Oriental. The National Democratic Front of the Philippines (NDFP) Negotiating Panel warmly congratulates the NDFP-Southern Mindanao Region for successfully carrying out the safe and orderly release of Prisoner of War (POW) Jose Mervin Coquilla today to foster the immediate resumption of peace negotiations between the Aquino government and the NDFP. 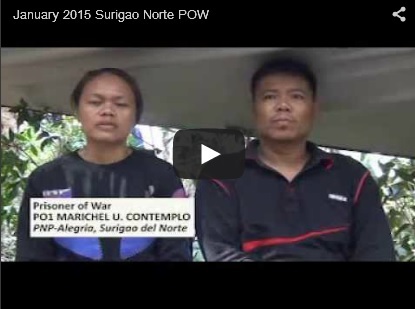 The NDFP Northeast Mindanao (NDFP-NEMR) regrets to inform the relatives and friends, the Third Party Facilitators and the general public that the release on 17 January 2015 of the three (3) Prisoners of War, namely PO1 Jorie M. Amper, PO3 Democrito B. Polvorosa, and PO1 Marichel U. Contemplo, negotiated between the National Democratic Front of the Philippines and the emissaries of Department of Interior and Local Government (of the Manila government), is cancelled due chiefly to the refusal of the Armed Forces of the Philippines to temporarily withdraw their COPD operatives from the area.